I wouldn’t normally review a place without trying the food, but this NEW outdoor restaurant under the Zizkov Tower is a place without the worry of unstable trees and park closures. Perfect for parents with babies and toddlers, the garden restaurant has a large, fenced in lawn, dog-poo free and clean. Better still, they advertise family lunches on Saturdays and Sundays with an entertainment program for kids. 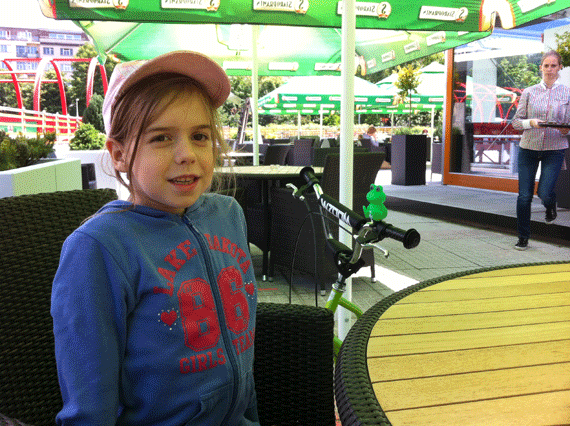 Lucie is turning 7 and when exploring our local area on her new scooter we ended up down in Mahlerovy Sady (right under the Zizkov Tower) and were happy to see the new restaurant in action. I’ve been keeping an eye on the restaurant development here for a while now, it’s construction was halted over winter but for the last few months it’s been a complete hive of activity. The name Miminoo is cute, it references David Cerny’s giant babies that climb all over the tower right above your head so it’s nice having real-life babies crawling on the lawn below! It opened on June 1st with a special Children’s Day celebration sending a message that the management would like this to be a ‘family-friendly and local’ type restaurant despite the tower’s tourist attraction status. This was reflected in the customers during our afternoon visit, old ladies sitting over coffee, mums with babies and blankets spread out on lawns, family groups etc. I was surprised at just how sophisticated they have made the interior, it’s a glass box from the outside - a promising ‘sun trap’ for the colder months - and the interior is cool, italian bistro style with a visible kitchen in action and dried meets hanging from cabinets. The menu is also italian in style - pastas, meats, salads, plus a few burgers. The standard of food looked pretty high and prices I’d say are similar to Coloseum and Grosetto restaurants. As it was early afternoon we just opted for a juice and beer. Staff were very friendly and smartly dressed but there was a bit of a wait for our bill and I noticed some confusion with waiters over someones food order so I think there are early day procedural issues being worked out. There are ashtrays on each outdoor table too so choose your tables wisely as someone may light up close by. As I mentioned earlier, on the blackboard out front they advertise ‘family lunch’ days on Saturday and Sunday with some kind of entertainment for kids - we’ll go check this out soon. They also mention that they do breakfasts too but I’m unable to find any info on what they serve - again, another excuse to visit. 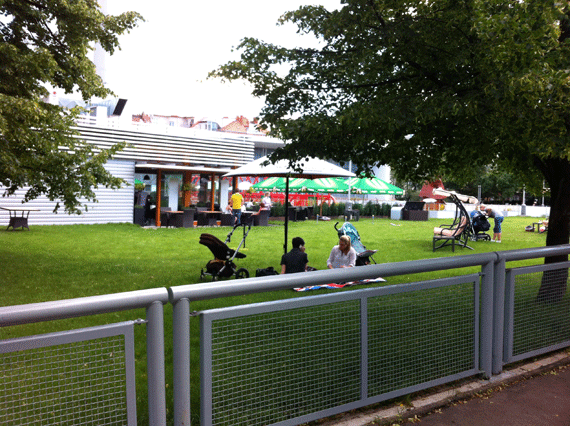 For parents with small kids there is heaps of room for prams and many tables overlooking the lawn. Alternatively, bring a blanket and settle in with your kids. Here they also have swing chairs for sitting and enjoying the outdoors plus free WiFi. 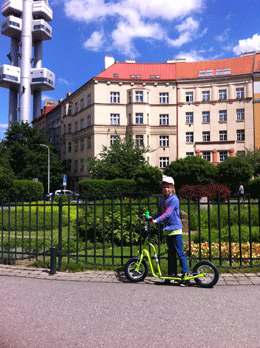 Children can also use the paved area outside to ride their bikes. 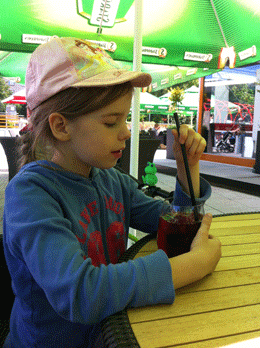 There is no real mention of the restaurant on Tower Praha’s website as the place is so new. So the best info as far as opening hours and the current menu is here plus you can also check out their Facebook page for more photos. There has been talk of a mini golf and a new playground being built in Mahlerovy Sady but so far nothing has appeared. Hopefully this is true and I’ll keep everyone posted as soon as I hear any news. DIRECTIONS: By Metro: Take the green line A to Jiřího z Poděbrad, it’s about a 5 minute walk to the tower. By Tram: Take Tram number 11 to Jiřího z Poděbrad or take 5, 9 or 26 to Lipanská tram stop then walk up. 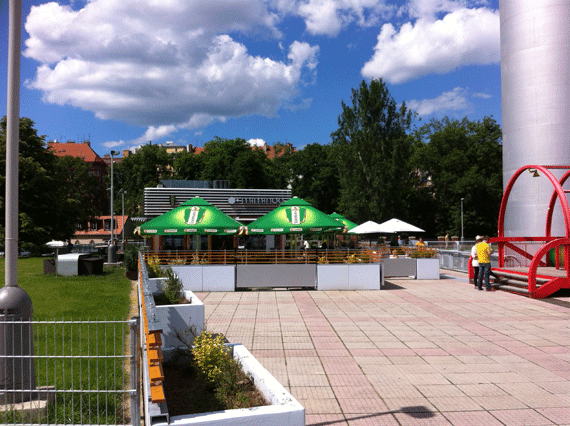 By Car: There is some paid parking spots in Ondrickova and Fibichova.